International economy Edition (book content & author is the same as original EDITION). PAPERBACK. Global shipping, item shipped right away using DHL/FEDEX and item delivery assured in 4-6 business days. NEW GOOD PRINT. Publisher: T & F/CRC. "This book is derived from a lecture course in data mining for MBA students. ... assumes very little in the way of mathematical or statistical background. The writing style is generally good, and the book should prove useful to its target audience." 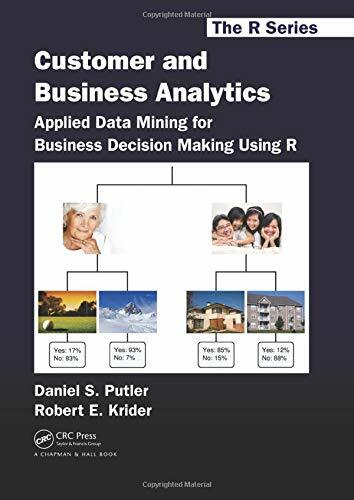 Customer and Business Analytics: Applied Data Mining for Business Decision Making Using R explains and demonstrates, via the accompanying open-source software, how advanced analytical tools can address various business problems. It also gives insight into some of the challenges faced when deploying these tools. Extensively classroom-tested, the text is ideal for students in customer and business analytics or applied data mining as well as professionals in small- to medium-sized organizations. The book offers an intuitive understanding of how different analytics algorithms work. Where necessary, the authors explain the underlying mathematics in an accessible manner. Each technique presented includes a detailed tutorial that enables hands-on experience with real data. The authors also discuss issues often encountered in applied data mining projects and present the CRISP-DM process model as a practical framework for organizing these projects. Showing how data mining can improve the performance of organizations, this book and its R-based software provide the skills and tools needed to successfully develop advanced analytics capabilities.